Grach Pistol aka the PYa, MP-443 in the military and law enforcement arena, and MP-446 Viking as a civilian version. It rhymes with Glock, but it seems that’s where the similarity ends. Russia’s Yarygin (PYa) pistol, otherwise known as the Grach, entered full service with the Russian armed forces earlier this year. It was actually adopted for the Russian army back in 2003, but it has only been in the last six months or so that a good number of Russian military units now possess it. The Grach, replacing the half-century old Makarov, has won praise from many of the Russian officers who carry it, but there are a few Grinches who say the Grach is no Glock. On a recent Moscow television program, local pundit Vitaliy Perevalov took the pistol to task and found in a head-to-head competition with the Glock, the Grach was schlock. One of the complaints was that the all steel pistol was much heavier than it need be and the innards way too complex for a military or law enforcement piece. To make matters worse, the Grach jammed during the filming of the program. Then another news guy, Sergey Sheynin, went on to show the superiority of the Glock. One has to wonder if these pundits and producers of this critical program will end up as “accident” victims courtesy of Vladimir Putin. It appears as though the Grach has one thing over the Glock and that’s its ability to fire super-hot +P+ 7N21 and 7N31 armor-piercing rounds. Evidently, the military requested several manufacturers to submit pistols for trials to replace the Makarov. 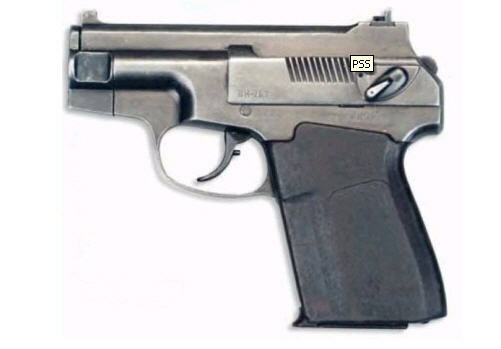 It should come as no surprise that state worker Vladimir Yarygin’s design and state arms manufacturer Izhevsk Mechanical Plant won with the Grach or, as it was called during the trials, the 6P35. Please note, the Grach is also known as the PYa and MP-443 in the military and law enforcement arena. The civilian version is designated MP-446 Viking. While it perhaps doesn’t quite make the grade as its Austrian counterpart, it is capable of firing that super-hot armor-piercing round. While the old Makarov only held nine rounds, the Grach holds 18 rounds of 9mm Para. And unlike the polymer frame Glock, the Grach is all steel; i.e. steel frame, steel slide and steel magazine. 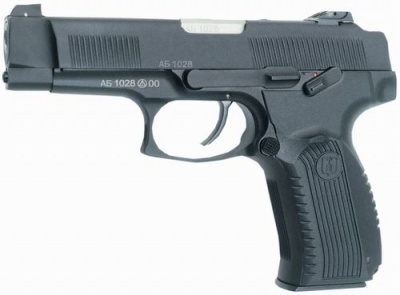 The beginning of the Grach story actually started in 1993 when the Russian government came up with the requirements it wanted in a new military service pistol. Basically, the requirements are what the Grach incorporates now: all steel construction, double-action trigger, and double-stack 17-round magazine. Of the three calibers considered: 9x18mm Makarov, 9mm Para and 7.62x25mm Tokarev, the 9mm Para (9x19mm) won out. Most of the features on the Grach are pretty much standard: short recoil-locked breech, double-action trigger, ambidextrous safety, wrap-around polymer grip panels and changeable right-hand/left-hand button magazine release. Isn’t it ironic then that special Russian troops are being taught the fine points of the M9 Beretta by American GIs. This past May, Russian Airborne Troops Force were undergoing anti-terrorist training at Ft. Carson, CO, hosted by the US 10th Special Forces Group (ABN). Amid the training, the Russian troops were given a seminar on the use and characteristics of the M9 Beretta and the M4 rifle. While the Russian troops were training in Colorado, the Russian state arms trader Rosoboronexport was in the Mideast proving that silence is golden. Rosoboronexport attended the 9th annual SOFEX international special operations forces weapons show in Jordan, showing off the PSS silent pistol and the new silenced 2B25 mortar. This mortar, effective out to 1,200 meters, is virtually silent, leaving no smoke or flame signatures. While pundits compare the Grach with the Glock, another famous firearms name wants to become even more famous. Believe it or not, Kalashnikov wants to become the new Beretta. Izhmash Group, the production company that manufactures Kalashnikov rifles, is in talks with the family of 92-year-old Russian weapon designer Mikhail Kalashnikov, on acquiring the right to use the Kalashnikov brand name. Izhmash only has the right to use the Kalashnikov name on the weapons it produces. The company would like to have rights to the name in order to branch out in other areas with a brand that is famous the world over. Meanwhile, by the way, look for Kalashnikov vodka at a liquor store near you.